Christmas is almost here, and chances are you’ll need all the money you can get for this expensive time of the year. Whether you want to surprise your loved ones with their dream gifts, or you want to give yourself a massive treat (you deserve it! ), you will definitely need some extra Christmas money. Whatever the case, there are several creative ways you can make some extra cash for Christmas. 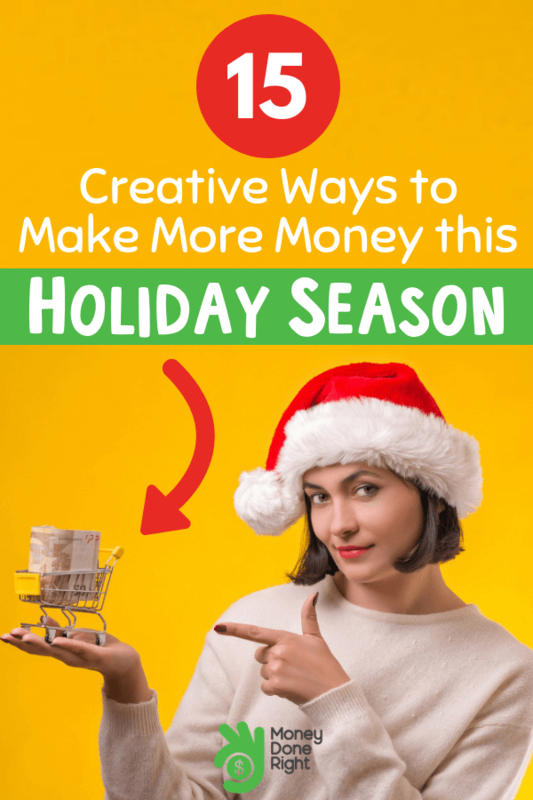 If you’re out of ideas, here are 15 creative ways to make more money this holiday season. Click here for more amazing ideas on how to get money for Christmas gifts! Filling online surveys won’t make you an overnight millionaire, but it can provide the funds you’ll need for this Christmas. Fortunately, there are lots of survey sites that can allow you to earn some pocket cash for Christmas without taking much of your time. The flexibility of filling out online surveys means you can be busy without it affecting your daily activities. Survey Junkie is one of the best online survey sites and a personal favorite because they pay cash directly to your PayPal or they let you redeem rewards for Amazon gift cards. Click here to sign up and start making extra cash with Survey Junkie. With Inbox Dollars, you can earn some quick cash by taking surveys, making purchases online, or just by watching TV. You’ll get a welcome bonus of $5 if you sign up. Click here to join Inbox Dollars and start earning cash! Pinecone Research pays $3 for every survey you complete, and you can select between PayPal, Amazon or restaurant gift cards for how you want to be paid. You can also earn some Christmas money for doing product testing. Pinecone Research is an invite-only site, which means you won’t have to compete with other users to complete surveys and earn money. Ipsos i-Say is one of the oldest survey sites in the market, established in 1975. The platform offers a wide range of survey and product testing opportunities to choose from, with a low redemption limit of $5, or 500 points. Another perk of working with Ipsos is they enter you into free draws (for every survey you complete) for extra cash and travel. You can make money on Global TestMarket by answering surveys, products testing, and feedback on products you already have around your home. The company has paid more than $30 million in earning since 2016, and your money can be paid as cash via PayPal or as gift cards. Click here to learn even more ways to earn extra Christmas money! Not everyone enjoys shopping while some don’t have the time for it. If you’re part of those who have a passion for shopping, you can earn Christmas money doing what you love by shopping for those who don’t. You can get the word around offering your services by advertising for free on Craigslist, Facebook Marketplace, or by telling your family and friends. You can charge based on hourly rates or by the distance of the trip. This is a cool way to make extra money for Christmas, especially if you like the bustle associated with holiday shopping. If you prefer to work for a company instead of individuals, here are some companies that require the services of a personal grocery shopper. Instacart Shopper lets you shop for customers who want fresh groceries delivered – either in the store (In-Store Shoppers) or to their homes (Full-Service Shoppers). With Instacart Shopper, you can earn up to $20 an hour, and the platform is excellent for those looking for flexible opportunities. Shipt is a member-based, on-demand grocery delivery platform. Unlike Instacart Shopper, Shipt needs Full-Service shoppers only. You can make money by shopping for groceries and also delivering them to Shipt’s members. According to the company, you can make up to $25 per hour working with them. Some grocery stores also offer their own in-house personal shopping/ delivery services. Some of these stores that hire personal shoppers on an hourly contract basis can pay as much as $25 per hour. All you need to do is to search for stores that need personal shoppers around you using a search engine. Check out these money-making tips to make extra cash for Christmas. You can earn some money by using Ibotta for your grocery shopping this Christmas. The Ibotta app allows you to get cash back on all your shopping. The company began as a grocery rebate app that allowed customers to earn cash backs on groceries. Now, you can use Ibotta at more than 350 retailers to earn cash back on your shopping. You get $10 as a Welcome Bonus when you sign up, and you can make withdrawals via PayPal once your balance reaches $20. You can redeem coupons, offers and upload your receipts to make extra money with Ibotta. Ebates is another alternative to use for your online Christmas purchases. You can get whatever you’re planning to buy for Christmas at a cheaper rate with Ebates than other retail stores. With Ebates, you can earn cash back, but unlike other sites, you can also apply for additional discounts, and it can be used for most online stores. You can save money on your online shopping and also make a little more cash at the same time. Sign up using this link to get a $10-bonus when you spend your first $25 through Ebates! Do you know that you could make some quick cash for Christmas by renting out your car? If you have a car that you don’t use regularly and you’re comfortable renting it out, this is a nice alternative to make some Christmas money. You can rent your car out using Turo as long as its mileage has not reached 130,00 miles, and the vehicle is less than 12 years old. Turo handles all the paperwork concerning renting your car, and they provide insurance worth the cash value of the car. You’ll need to provide necessary information like the license plate number, car model and make, year, and a photo of the car to list it for rental. You’ll also need to check with your insurance provider to confirm that they will cover damages in the event of an accident. Sign up for Turo and get your car to work for extra cash! A lot of businesses boom during the holiday season and meal delivery isn’t left out. During Christmas, people are usually too busy with holiday shopping or taking care of other errands. Delivering meals with UberEats or DoorDash can be an excellent avenue for you to make money for Christmas gifts. Unlike driving for Lyft, meal delivery doesn’t have strict requirements. You can deliver meals with whatever means of transportation is available to you – scooter, motorcycle, or a bicycle. Meal delivery with UberEats and DoorDash is flexible, and you can choose your working times. Here are a few more way to make quick Christmas cash for all the gifts you want to buy! During the holiday season, many companies hire designated drivers for their guests or staff attending holiday parties. As such, this is a great time to make some money for Christmas as a designated driver. If your work schedule isn’t too hectic, you can also get paid for running errands for your friends and co-workers. You can drive for Lyft and earn good money while at it. You get to determine your work rate, and this option is perfect for people who like driving and have free time on their hands. Lyft offers a $300 sign up bonus as an incentive to new drivers who complete 300 rides. Sign up for Lyft and start driving today to round up your income! Working as a virtual assistant (VA) is one of the best ways to make extra money not only for this coming holiday season but also all year round. VAs help people with tasks like scheduling meetings, social media and email management, editing blog posts, data entry and many more. As a newbie, you can earn between $15 to $20 an hour, and by the time you’ve gotten the hang of the job, you could be paid more than $30 per hour. Here are some examples of Virtual Assistant jobs that pay well. Bloggers and other entrepreneurs know how important social media is to the growth of their business, but they don’t always have the time to give it the necessary attention it deserves. You can come in as a social media virtual assistant and be in charge of managing social media accounts. There is a lot that goes into keeping a blog working. Content planning, email marketing, list building, social media promotion, networking, content upgrade, and guest posting are just a small bit of all the things that go into blogging. You can find a niche in any of these areas, and start getting paid for your services. From the comfort of your home, you can be a moderator for Facebook groups and other communities built by online businesses. Moderators ensure that conversations on the chat group or other platforms don’t become inappropriate. You can also serve as online support for customers who need assistance if something goes wrong. Want to know more? Check out these awesome side hustle ideas and earn the Christmas money you need! Are you a native English speaker? Do you have a Bachelor’s degree? Are you in your final year of college? If yes, you can earn money teaching English to international students online. VIPKid is a service that links English speakers with those who want to learn. They provide all the lessons plans and course materials you’ll need, and classes are done from the comfort of your home. VIPKid pays around $22 per hour. And all the requirements to teach are a computer and a webcam. VIPKid is flexible enough to allow you to choose your working times. Your overseas students are aged between 4 to 12, and there will be no more than four students in one class. EF Education First is the largest foreign language company in the world. It is not restricted to only young kids, as you also have an option to teach adults. Like the other opportunities, you get to choose your work times. Gogokid requires at least a Bachelor’s degree from their teachers. You will only teach one child per session. The highlight of working with Gogokid is that they offer $300 as a welcome bonus for new teachers. Did you know that you could be paid to lose weight? Surprising, right? In case you didn’t know, there are a couple of ways you can make money losing weight. So, you get to earn extra cash for Christmas and also cross “losing weight” off your 2018 resolution. Here are some options you’ll want to consider if you want to get paid for losing weight. HealthyWage is a site that lets you join weight loss games with the promise of a financial incentive if you hit your weight loss goal. To get started, go to the website and enter how much weight you want to lose (must be at least ten percent of your body weight), and the amount of time it would take you. You’ll also input how much you want to bet. HealthyWage has a handy calculator that determines how much money you can win, which is up to $10,000. If you meet your weight loss goal, you will be paid in either cash, PayPal, or via credit using Amazon. Click here to join HealthyWage and see how much you can win by losing weight! You can make money for losing weight with DietBet by betting on yourself to lose weight by competing in weight loss games. You can place bets as low as $10, and if you win, you can collect your money via PayPal. If you’re a good writer, there are lots of online opportunities for you to make money before and after Christmas. Many companies require content from blog posts to speeches, and if you have experience on a subject matter, or you have excellent research skills, you can earn money from this. As a freelance writer, you can earn between $20 to hundreds of dollars depending on the work you’re paid to do. Once you have some regular clients, you’ll have a more guaranteed income stream. Do you have a flair for creating homemade things? If you do, you can turn that creative skill into quick cash. Now that Christmas is fast approaching, handmade products like crafts, candles, clothes, soaps, or jewelry are always high in demand. You can set up an Etsy store that deals in creating these handmade items. Marketing your business and attracting potential customers to your store won’t be too much of a problem. Crafts on Etsy are usually well sought after during the holiday season. In a short while, you can make all the extra cash you need for all your Christmas expenses. How much of your old stuff do you have lying around the house? Rather than having all those junks clutter up your space, you can get rid of them using Decluttr. Decluttr collects old electronic gadgets, games, DVDs, and more. Apart from helping you clear your apartment, you can also earn extra cash for Christmas by disposing of your old electronics using Decluttr. To get started, visit the Decluttr site and type in the barcode of the gadgets you want to dispose of. You’ll get a notification from them saying how much they’ll pay for those items and a packing slip to mail your items. Within less than 24 hours of receiving your products, you will receive your money via either direct deposit or PayPal. Here are over 100 more ideas to make some quick cash for Christmas. Retailers employ the services of mystery shoppers to help them improve goods, services, and general customer service. You can make your purchases in different shops, and the retailer will pay you for the mystery shop and also give you extra cash for the item you purchased. Jobs2Shop is a platform that can help you find local mystery shopping openings. Each job usually involves you doing a specific number of tasks like taking pictures of an item or doing price checks. You can earn about $85 for every shop you visit. Apart from this, you can also make money by completing surveys or playing games on the Jobs2Shop site. Babysitting is one of the more common methods of making extra money. Even more so during holiday breaks when kids are out of school. Parents have to attend parties and events and this holiday season, and this is a prime time for you to make money for Christmas. No local clients? No worries. You can create an account on Sitter or Care, allowing parents to check your references and run a background check before they can request for your services. Click here to see more tips on earning extra cash for Christmas! This list barely scratches the surface of ways to make extra cash for Christmas. 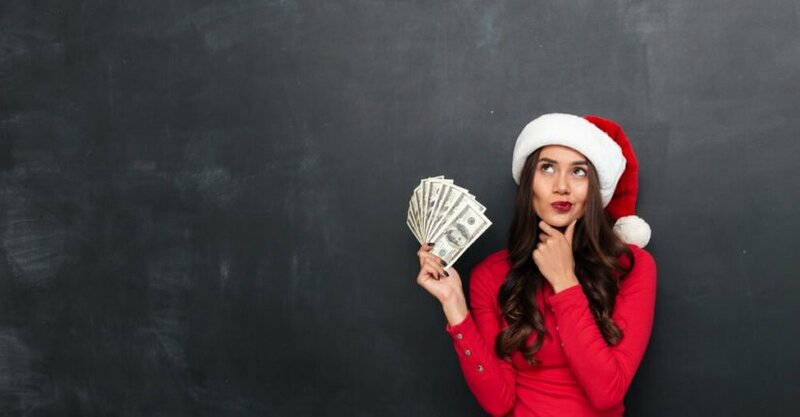 However, if you use some of these ideas, you should have more than enough cash to cover your Christmas expenses this year and tide you over to 2019. Do you have any other money-making tips for Christmas? Let us know in a comment below!